No bake desserts = no fuss. I think that’s one of the big reasons why so many of us love them. They are typically quick to make and don’t require slaving away over a hot oven. Most importantly, they are delicious! Who can resist such a yummy sweet treat? Not this gal. My favourite? 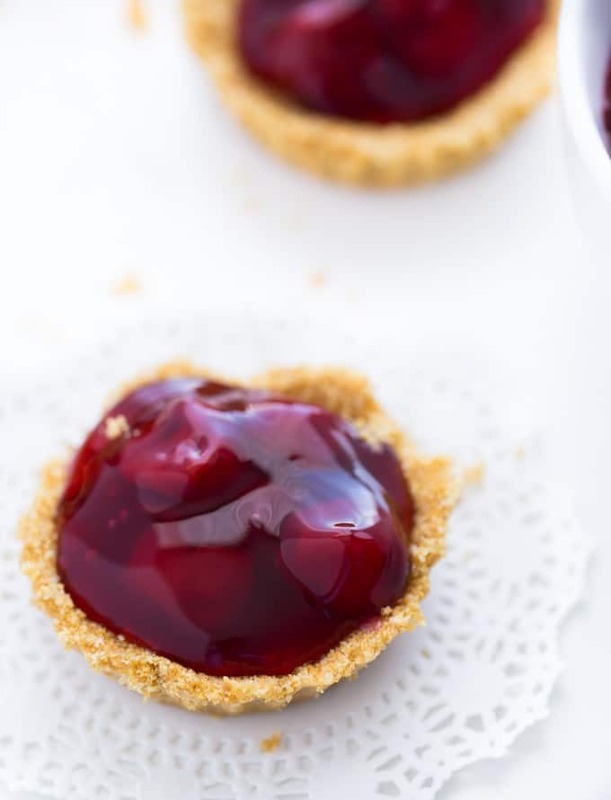 These No-Bake Cherry Tarts. 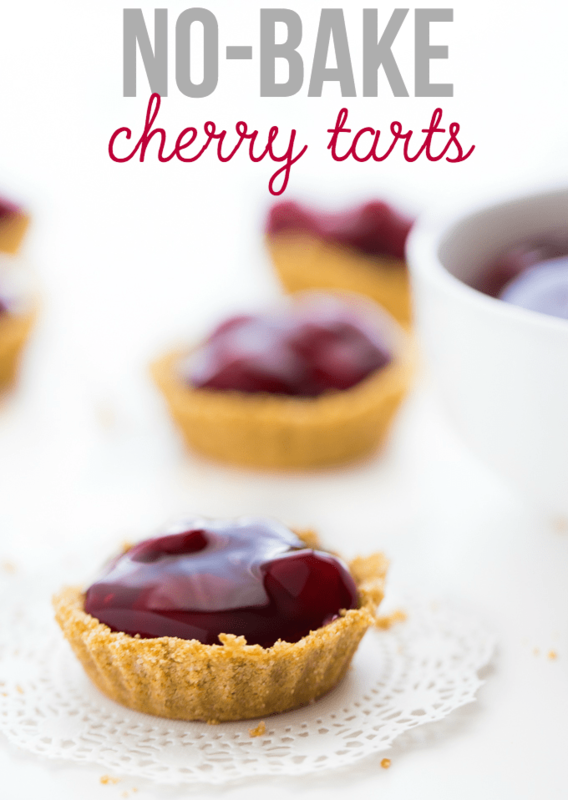 I made these No-Bake Cherry Tarts with a Wilton Mini-Tart Pan. It’s getting a ton of use lately. It has a graham cracker crumb crust and cherry pie filling. There’s literally nothing to making it – besides waiting for your crust to firm up in the fridge! I think that’s the only downfall is that you can’t make it and eat immediately. Because I really wanted to….. It probably would have tasted good, but the pictures would have been terrible! This dessert would also be a good one to make if you are expecting company. You could make the shells the night before and all you’d have to do before serving is spoon in the cherry pie filling. Top with a little whipped cream to fancy it up! Try other types of filling if cherries aren’t your preference. I have some blueberry pie filling in the pantry so I’m going to make them with it next. Here are a few more no-fuss, no-bake desserts to try: No-Bake Nougat Bars, Rocky Road Bites and Lemon Cheesecake Mousse. What no-bake dessert should I make next? I’d love some recommendations! Made with a graham cracker crumb crust and stuffed with cherry pie filling. You won’t be able to get enough of this easy, no-bake dessert! Spray a mini tart pan with cooking spray. In a medium sized bowl, stir together graham cracker crumbs, butter and sugar. Add a tablespoon or so to each cavity. With clean fingers, press graham cracker mixture into the bottom and sides of the tart pan. Refrigerate 2 hours, at minimum, or overnight. When ready to serve, remove tart pan from the fridge. Turn upside down and give a firm tap to each cavity to remove graham tart. 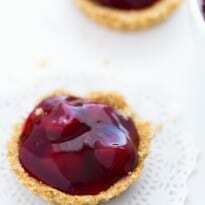 Add 1 tbsp cherry pie filling to each tart to serve.